That scandal, coupled with one that ended news anchor Megyn Kelly's time with NBC, have brought the issue of blackface - and the historically painful meaning it has for African Americans - to the forefront of the national conversation. Opinions were also divided along party lines, with Republicans more likely to find blackface acceptable. 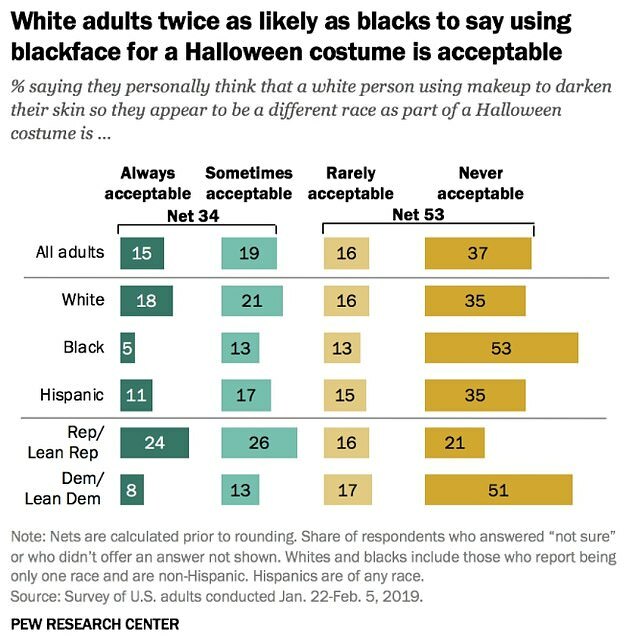 Roughly half (51 percent) of Republicans and Republican-leaning respondents felt blackface was acceptable at least sometimes, with 24 percent of those saying it’s always acceptable and 37 percent saying it is rarely or never acceptable. More than two-thirds (67 percent) of Democrats and Democratic leaners said black face is unacceptable, while 21 percent said it is always or sometimes acceptable. 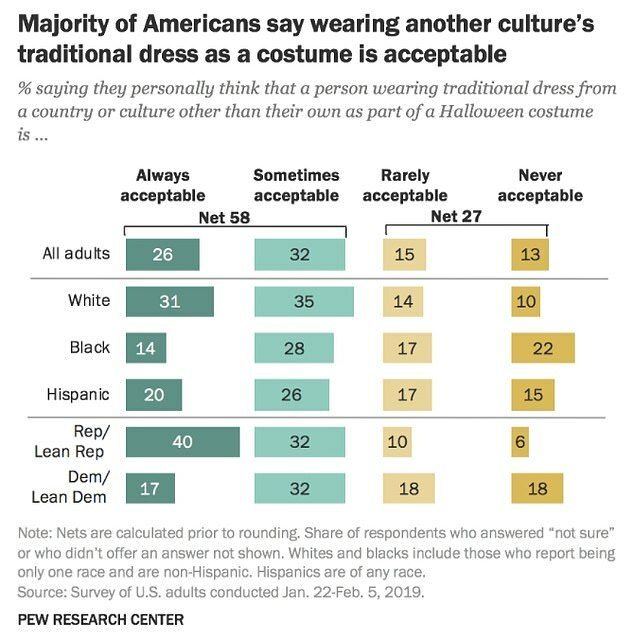 The survey also asked Americans whether it was acceptable to wear traditional dress from a different country or culture, with 58 percent saying it was always or sometimes acceptable and 27 percent saying it’s rarely or never acceptable. Again, researchers found differences along racial and ethnic lines, with 65 percent of white people saying dressing up like another culture was always or sometimes acceptable, compared to 41 percent of African Americans and 46 percent of Hispanics. Similarly, 72 percent of Republicans found such costumes acceptable, while 49 percent of Democrats felt the same way.